We’ve got food on the brain lately. Actually, we’re going to have food on the brain all the time now! Divi Resorts recently hired Matt Boland, a well-known wizard in the kitchen and award-winning chef, to work his culinary magic at ALL of the Divi restaurants. He is fast at work revamping food and beverage offerings and presentations. 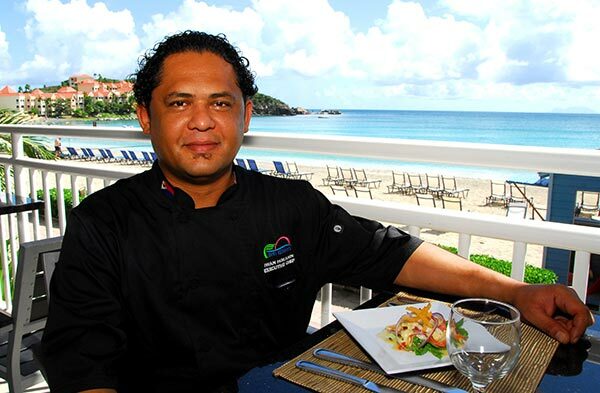 Today, there is more delicious Divi food news: This fall, Iwan Hokahin took the helm as executive chef of Divi Little Bay Beach Resort in St. Maarten. Iwan, too, is a top-notch chef who’s come to Divi Resorts straight from that little place in the Bahamas called The Atlantis. Heard of it? Well, now Divi has gained one of its top chefs, and our guests will enjoy the fine dining experience Chef Iwan brings to the table. We are especially excited to have Iwan at Divi Little Bay Beach Resort because he’s a native of St. Maarten. So, it’s a homecoming for him and certainly a celebration for Divi! Schooled and trained in Europe, he brings a wealth of global experience to his role as leader of the resort’s three restaurants. Iwan is the son of a Surinamese father and Dutch mother, and as a result, he embraced the panoply of flavors at a young age. Expect to see European and Asian techniques in the cooking and the plating. He also has a passion for the food of his youth and intends to present authentic Caribbean cuisine in a gourmet way. Prepare to be dazzled with deliciousness in every way! Previous PostJust wait till you taste what this guy is cooking in Barbados! Meet Chef Henderson Butcher.Next PostNew Year, New You! Kick-start your 2015 fitness goals the Divi way!